Grain de musc: Blanc de Courrèges: What smells white? 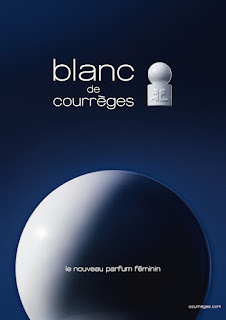 Why does Blanc de Courrèges manage to pull off its iris-patchouli gourmand accords much more joyfully and engagingly than Lancôme’s La Vie est Belle? When millions ride on a launch, a perfume is bound to give off more than a whiff of fear. The stakes riding on Blanc are comfortably lower. Courrèges may be a mythical brand, but in fact it sits somewhere between niche and luxury. Its new owners, Jacques Bungert and Frédéric Torloting, used to run the advertising agency Young & Rubicam: they managed to nab the brand under the noses of much bigger suitors, Bernard Arnault and François Pinault, by convincing Coqueline Courrèges that they would carry on with the founder’s vision. Quite cleverly, they’ve decided not to hire a big-name designer, relying instead on the house’s impeccably modern and therefore timeless range of designs (if it ain’t broke, don’t fix it). No big-name face for the perfume campaign either: Courrèges is a strong enough brand not to ride on a celebrity’s coat-tails. Via Lorience,the company that handles the Mauboussin and Lulu Castagnette licences, they entrusted the reformulation/restoration of two house classics, the rich rose chypre Empreinte and the mint and absinth-topped citrus chypre Eau de Courrèges, to Vincent Schaller of Firmenich (where the formulas were created), who states that he was given a generous budget for beautiful raw materials. And for the launch that marks the return of Courrèges perfumes to a wider-scale distribution, they picked the submission of a young perfumer, Julie Massé of Mane. The brief was "white". Massé answered it with a simple enough idea: bringing together notes that smell white. Aldehydes and iris for the clean linen touch. White musks, obviously. Heliotropin, whose almond facets recall white glue. To turn it into “Courrèges white”, Massé used patchouli, present in both Empreinte and Eau de Courrèges, which she also perceives as an expression of the architectural aspect of Courrèges designs, since as a wood note it brings structure to the composition. To turn patchouli white, she used a distilled version scrubbed of its camphor and musty-leaf facets, literally listed as "white patchouli". After a glaring burst of white brought on by pink pepper, aldehydes and iris with a slightly fruity-rosy touch, Blanc goes into a more intensely sweet phase mid-way through its development, the crisp-textile white giving way to the smooth coating of a sugared almond. The patchouli base, present from the top notes (let no perfume pyramid convince you that patchouli doesn't act from top to bottom) takes over more strongly during the dry-down. There’s enough action and evolution in Blanc’s development to keep the nose engaged, but not to the point that the scent is using you as an exhibition space. This ease of wear, with the notes smoothed out into a fluffy haze is what I’m coming to see as the in-house Mane style. Could it be the influence of Christine Nagel, who heads the team of fine fragrance perfumers and is in charge of training the younger ones? I’m detecting this manner in most of the work Mane perfumers have been doing for Etat Libre d’Orange: Like This and Bijou Romantique by Mathilde Bijaoui, Dangerous Complicity by Violaine Collas (to be launched in September) and of course Archives 69 by Christine Nagel. With another story and a few tweaks, Blanc de Courrèges could have belonged to the same series.This is what mainstream could be, if it cut itself a bit of slack. So encouraging - must try to find these in order to lend support to these chaps trying to do the right thing by a brand for a change! Nozknoz, Blanc will be launched in September, and the reissues are available on the website, not sure about the international roll-out. I did get a chance to sniff but don't have samples, so no skin test. But Empreinte smelled nice and rich. I never wore it so it's hard to compare with the original, but Vincent Schaller did work from the original formula. The bottle looks stunning! So stylish and humorous at the same time! As for availability a quick google-search showed it is available online by e-tailers. Empreinte is for sale too. Kostas, it's the original design of the Courrèges bottles, turned white. If it ain't broke, why fix it? I love its retro (now) futuristic look as well! Nicola, what I called "sullen" about the new Lancôme is that stickiness that traps the other accords so that they can't express themselves. Haven't had the time to sample the new Acqua di Parma, I like the two original version of the Iris Nobile quite a lot though to me they were just as much about orange blossom. 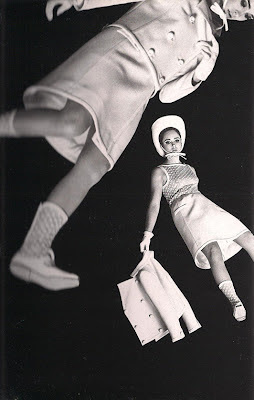 The Courrèges is worth seeking out. Your evocative write-up has got me gingered up for this one. I'm heartened by hearing about a brand that has the courage of their convictions and isn't pandering for sales. Not like the yak-attack of Chanel's Coco Noire. Katie, I hope that the new owners of Courrèges walk their talk by preserving the founder's spirit -- certainly, every single item they've re-edited is drool-worthy. Blanc de Courrèges isn't a revolution, but I find it charming, chic and optimistic.